The biggest struggle most people encounter in their curly journey, is the protein moisture balance. So in this post, I’m going to walk you through it, why it’s important and how to get the balance right. How to tell the difference, and know if you’ve got too much moisture, too much protein, and how to re-balance your hair from both. 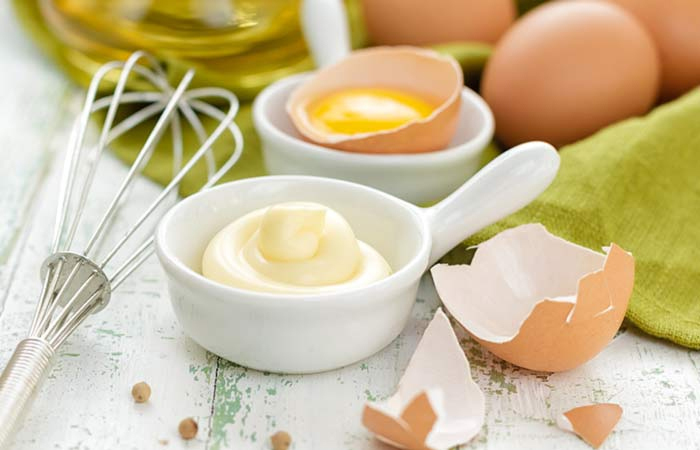 Why is Protein Moisture Balance so Important? What seems to happen to so many people once they start the curly girl journey, myself included. We focus so much on moisture and hydration, because we’re told that’s what curly hair needs, what it lacks. 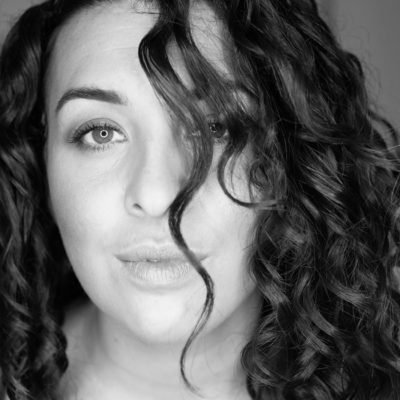 If we just hydrate and moisturise our hair correctly, we will get perfectly defined, frizz- free curls. And we either don’t know, or we forget about protein, and the importance of it in our routine. Protein is what our hair is made of. It gives hair strength and structure. It’s just as important as moisture. Just like a healthy food diet, you’ve got to have a healthy balance for your hair too. In order for your hair to be in a healthy, balanced state, you need to have the right protein moisture balance for your hair. Each person’s hair is different, so it’s important to get to know your own hair; how it feels, how it looks and what it’s telling you. 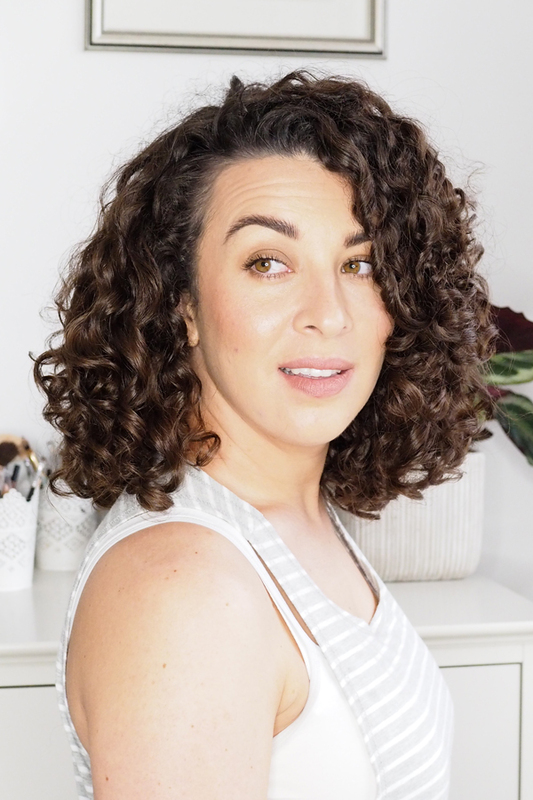 When your hair has the right protein moisture balance, you get consistent curls and consistent results from wash days, refreshing and how your hair looks in the days in between. When my hair is over moisturised, it feels soft, limp and lifeless; lacking volume and curl pattern. My curl pattern is so much looser than usual, often just a loose wave, or even straight, instead of my usual tight curls. It won’t hold a curl, no matter what products I use, or how strong the hold is. I often struggle to get a cast, despite using strong hold gels, simply because there’s just so much moisture in my hair! My hair will stretch, a lot, before it snaps. Sometimes it doesn’t snap at all, but just pulls out from the root. Despite going many days since washing your hair, it still won’t feel dry, or like it’s lacking moisture or needs hydration. Hair that has been bleached, highlighted or chemically treated is often dry, but also lacking in protein. So although you may not have over moisturised hair, still follow the tips on how to re-balance it, to get your protein levels back to a healthy level. A sign of over moisturised hair is also lots of wet frizz when you’re cleansing and conditioning your hair in the shower. It looks like I’ve got those smooth, silky, seaweed curls while the conditioner is in. But as soon as I rinse it out, I immediately have a tonne of frizz between my curl clumps. And it only gets worse the more I squeeze excess water out of my hair, or scrunch and pulse to encourage my natural curl pattern. Usually I’ll use my Denman brush to help clump my curls back together, but when my hair is in a severely over-moisturised state, even this doesn’t work! When my hair dries, I have a lot of frizz. But the frizzy hair doesn’t feel dry; it feels soft, smooth and moisturised. What Causes Hair to be Over Moisturised? There are a few things that cause over moisturised hair. Such as washing your hair, or conditioning it too much. Leaving your hair wet for too long, or too often. Sleeping with wet hair. Leaving deep conditioning treatments in your hair for too long, or overnight. Using products throughout your cleansing, conditioning and styling routine that don’t contain any protein. Using products, often cheap and with poor quality ingredients, that are full of heavy oils, butters and moisturising ingredients/agents. Top Tip: Don’t wash, refresh or wet your hair daily. Don’t wet plop or do the “bowl method” for ultimate hydration. All these will only make things worse! I’m going to do a more detailed post on Hygral Fatigue soon. But it’s not the same as over moisturised hair. Hygral Fatigue is the next level, and is much harder, and takes longer, to recover from. If your hair has all all the same symptoms I described above, but much more extreme. And your hair feels incredibly mushy and gummy, like candy floss; either when it’s wet or dry – then you’ve got hygral fatigue. When I had hygral fatigue, my hair felt like it was going to disintegrate away between my fingers when I touched it. And it had no curl whatsoever! 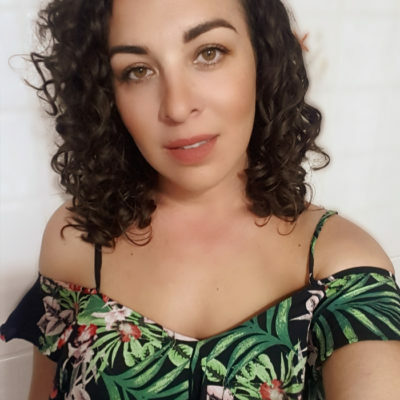 My curls had completely gone! I was left with incredibly soft, limp, lifeless, frizzy, straight hair. More on hygral fatigue coming soon. Whenever my hair is in a funk and not behaving, or responding, how it usually does, and nothing is “working”. I find clarifying really helps to press that reset button. You can read more about clarifying in this post; why, how, what to use and how often. But for over moisturised hair in particular, it helps to strip excess moisture from the hair, and build up from products, hard water, oils and heavy butters etc. 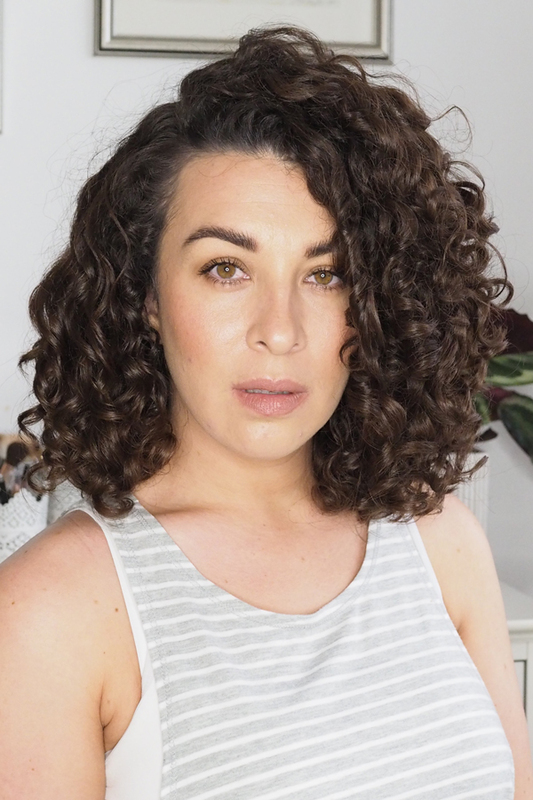 It’s not in the curly girl method, but this is when using a sulfate shampoo can actually help, and be a good thing! 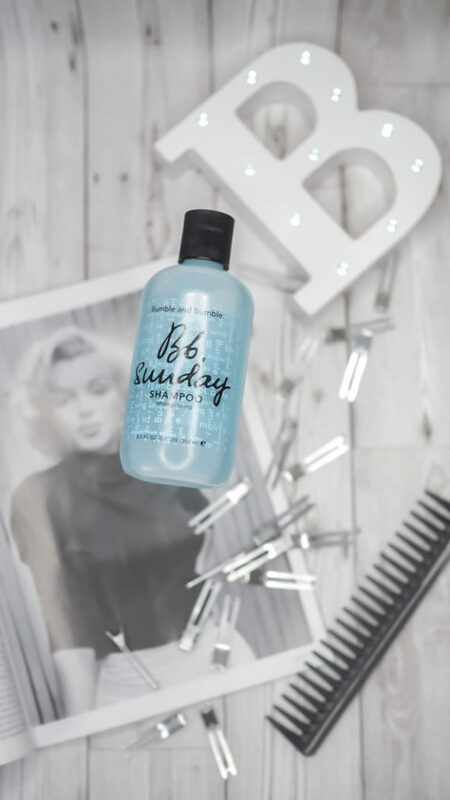 Bumble & Bumble Sunday Shampoo is my long-time favourite. One bottle lasts me almost 2 years! Also available in my Amazon Shop! Clarifying helps prepare the hair to better absorb products such as deep conditioners, now that all that build up is cleaned and clarified from the hair. If your hair is over moisturised, washing your hair every day, or too often, can make the situation worse. It’s a vicious cycle because the only time your hair seems to hold any kind of curl is on wash day. But the problem is, each time you wash your hair, you’re introducing more and more water, hydration and moisture – making the problem worse. So try to go longer between washes. Skip leave in conditioner. If your hair is really over moisturised, you can skip conditioner too! Just cleanse and style your hair, until your hair is balanced again. Then you can re-introduce conditioner into your routine. Squeeze out as much excess water out of your hair as you can, before or after applying styling products – whichever you prefer. 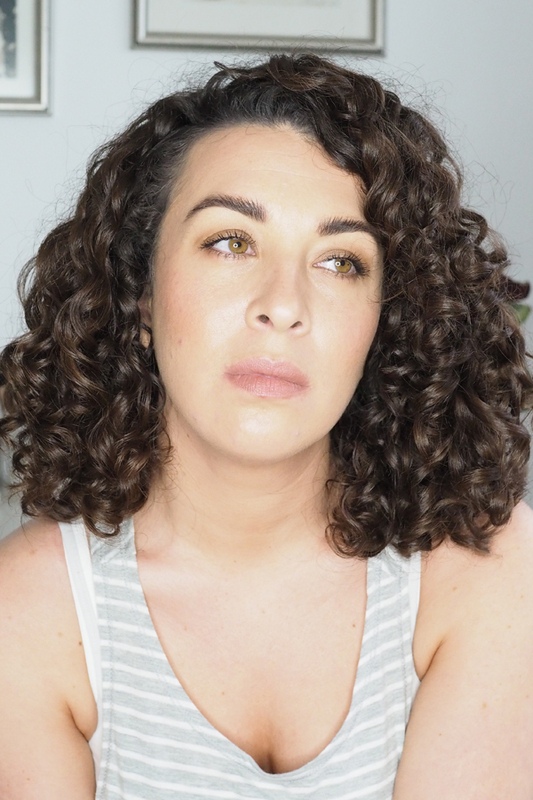 I’ve found DevaCurl’s microfibre curl towel gets the most moisture out of my hair. Diffuse until your hair is fully dry, to avoid it being wet for too long. Take a look at the products you’ve been using in your entire routine recently. If your hair is over moisturised, you’ll probably find most of your products, if not all of them, don’t contain any protein. Or only small amounts, quite far down the ingredients list. 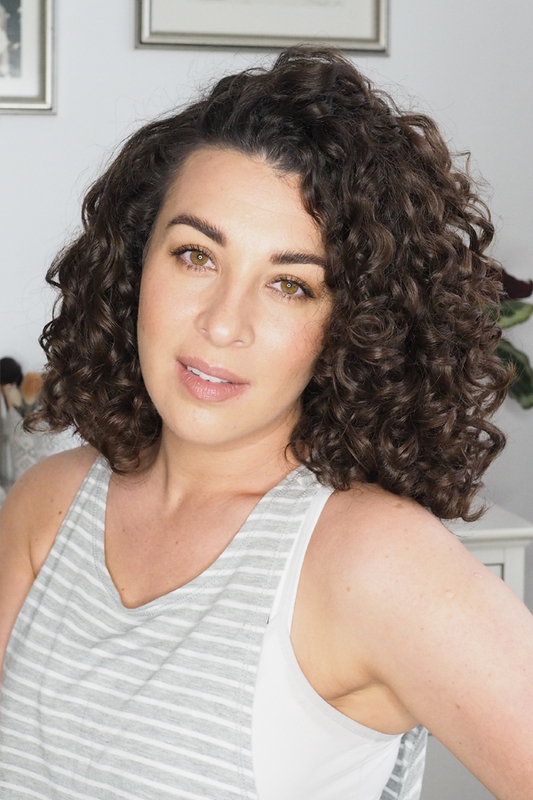 Check out my post on How to Build a Curly Girl Routine for help and guidance on products to suit your hair’s needs. Such as moisture, protein, and a balance of both, with product and routine recommendations. You need to change up your routine, and introduce some products that contain protein to get the balance right. 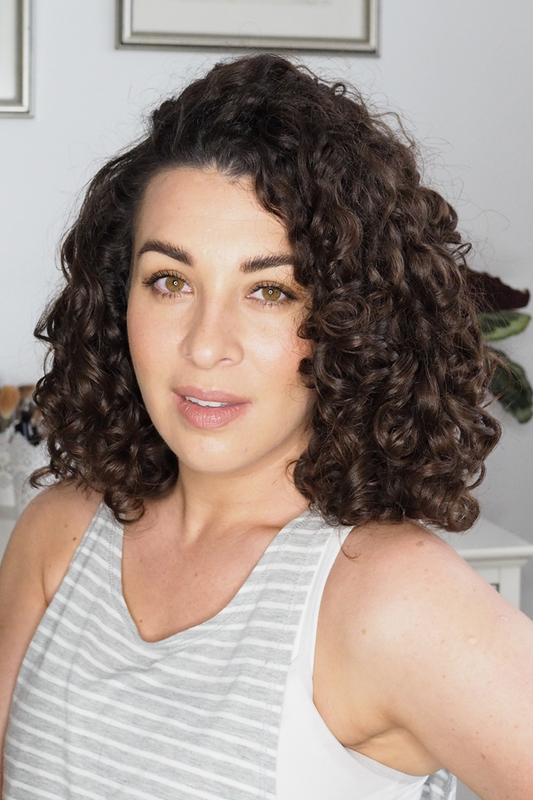 DevaCurl and Bounce Curl are my favourite lines of products that contain protein. Use code CURLYCAILIN10 for 10% discount on all products on the Bounce Curl site. Using products that contain salts, such as Rockin’ Ringlets, Confident Coils and Spiralicious Gel from Jessicurl will also help. Use code CURLYCAILIN20 at checkout for 20% discount across the entire Jessicurl site. If you’re in the EU, or UK, you can buy Jessicurl here. If you’ve tried all of the above, and you’re still not seeing a noticeable difference and improvement in your hair. That’s when I do the Aphogee Two-Step Protein Treatment. It’s not strictly curly girl friendly, as it contains silicone. But it’s not high up on the ingredients list, and it’s a necessary “evil” I’m willing to compromise on when my hair is in a highly over-moisturised state. Click on the video below to watch my YouTube video on the protein moisture balance, answering your questions from Instagram Stories; and how I apply the Aphogee Protein Treatment. Don’t forget to follow me on Instagram! It’s where I’m most active, interacting and engaging with people, replying to DM’s, and run giveaways and competitions. Please subscribe to my YouTube Channel, if you haven’t already. I’ve got lots more videos planned and coming your way soon! 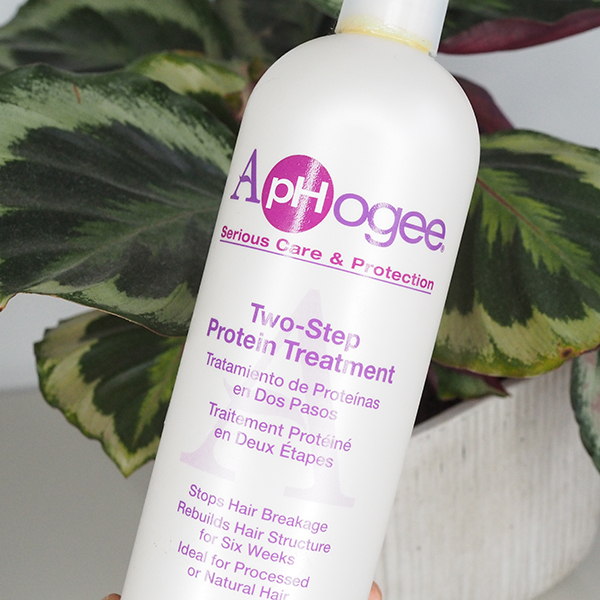 When doing protein treatments such as gelatin or Aphogee, it’s important not to touch your hair. As it dries into a hard, solid cast; touching, agitating, or brushing the hair will cause it to break and snap. When it’s time to rinse it out, let the warm-hot water soften your hair before you touch it, and massage the treatment out of your hair. Make sure you always follow up with a good conditioner, or deep conditioner after doing a protein treatment, especially a strong one. The deep conditioner doesn’t necessarily have to be protein-free, I prefer to use one that contains protein. But they also have lots of moisturising ingredients too, to avoid drying out the hair. There are lots of different proteins: keratin, collagen, amino acids, vegetable, soy, corn, quinoa, wheat, silk, rice and whey. Often listed as “hydrolyzed.” There’s also DIY protein treatments, I’ve tried all of them. But they don’t seem to work or make a difference. Most DIY protein recipes include ingredients such as eggs, mayonnaise, avocados, yogurt, coconut milk or oil, bananas, honey and olive oil. The reason they don’t work, is because the molecules are too big to penetrate the hair shaft. So they pretty much just create shine, and leave a huge mess in the kitchen, bathroom and whatever you’re wearing when you apply it. But your hair is still limp, lifeless and lacking curl. One of the biggest myths around protein is that low porosity hair types should avoid it, and low porosity hair doesn’t respond well to protein. This is simply not true. As I said at the start of the post, our hair is made of protein! It’s about finding what form of protein your hair prefers. For example, my hair responds well to protein in cleansers, conditioners, deep condtioners and treatments, such as the ones already mentioned. My hair loves Bounce Curl cleansers, which contain protein – use code CURLYCAILIN10 for 10% off all products on the Bounce Curl site. But it doesn’t like styling products that have a lot of protein in them. Such as the cult-favourite, Bounce Curl Light Creme Gel or Deva Curl Gels. Now, lets switch to protein overload. Symptoms include brittle hair that snaps and breaks very easily. Often appearing dull and lacking shine, and frizzy. But it’s a different kind of frizz to over moisturised hair. It feels very dry, wiry and straw-like. Your hair feels like you cannot get enough moisture to soak up into your hair. No matter what, or how much product or water, you use! I may be wrong, but my personal theory is that looser curl patterns tend to be more prone to moisture overload, and tighter curl patterns tend to be more prone to protein overload. Let me know in the comments if you agree with this theory or find it to be true or untrue – I’d love to know your thoughts! Protein overload is often caused by a protein-heavy product routine, that’s not sufficiently balanced with moisture. Or overdoing it on protein deep conditioners or treatments, such as the ones mentioned above. It’s easy to get caught up in the hype on Instagram and curly Facebook groups of various protein treatments, and the benefits from doing them. But if your hair isn’t lacking or needs protein, you run the risk of protein overload! The aim of this post, and this blog, is to help you understand and listen to your hair, and what it’s telling you. So you can give your hair what it needs, rather than following trends and wondering why your hair is mad at you. 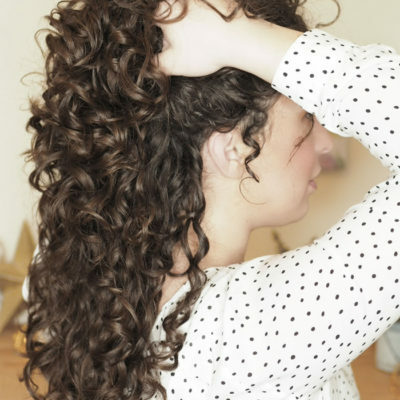 That’s the secret to amazing curly hair – understanding your hair. Follow all the same instructions as detailed above for clarifying. The main reason is you need your hair to soak up and hold lots of moisture. If your hair has got product or mineral deposit build up from hard water for example, or you use products with heavy oils and butters. It’s going to form a film/coat on the hair that prevents moisture from getting in and penetrating the hair shaft. 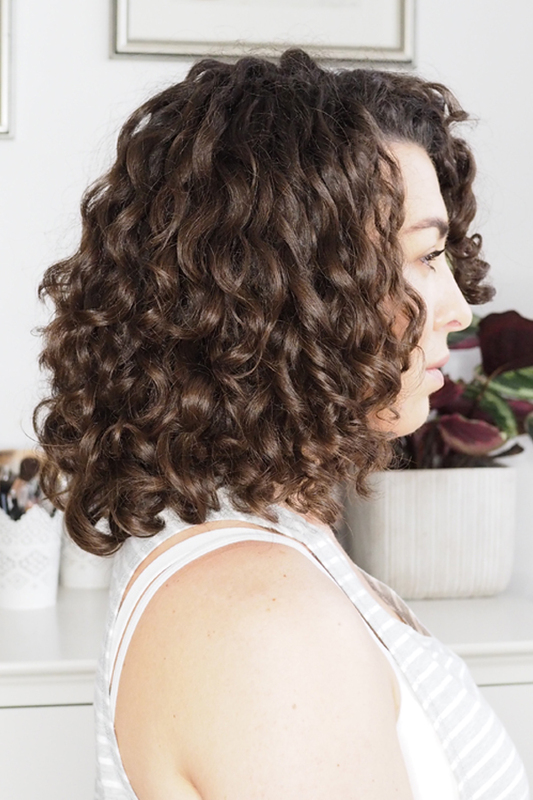 Techniques such as the “bowl method” for ultimate hydration, wet plopping, squish to condish, and rake wet scrunch – check out YouTube and Instagram for demos and explanations of all these techniques. These are all great ways of getting maximum hydration and moisture into the hair. I still wouldn’t recommend sleeping in the plop, or deep conditioners though – as that comes with it’s own problems. Again, as above; check the ingredients of the products you’ve been using across your entire routine recently. If you’re experiencing protein overload, you’ll notice most, if not all of them, contain protein. You need to change up your routine, and introduce some protein-free products to get the balance right. Or switch to a completely protein-free line until your hair is re-balanced and you can re-introduce some products containing protein. 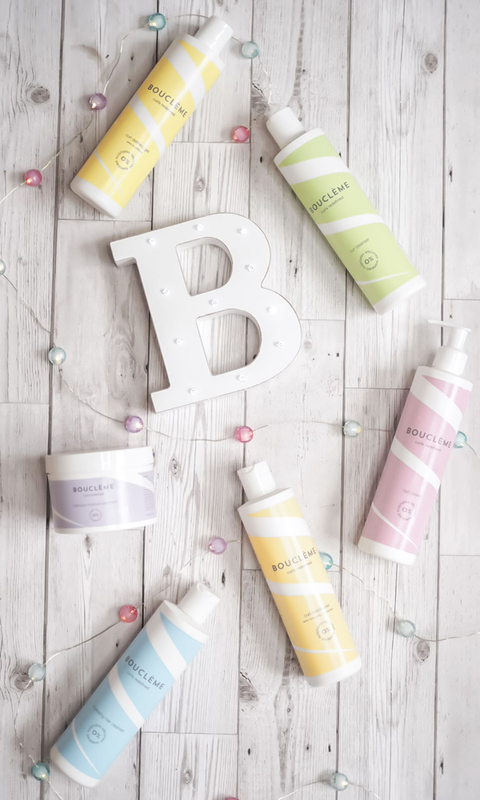 Boucleme and Jessicurl are my favourite protein-free lines of products. Use code CURLYCAILIN20 for 20% off the Jessicurl site. Once you’ve got your hair in a healthy, balanced state. It’s important to maintain that protein moisture balance. Building the right product routine for your hair will help maintain that balance, make sure you read this post. And regular deep conditioning will help tweak the balance, depending on what your hair needs more of. Just because you’ve experienced protein overload, doesn’t mean you should avoid protein forever. And the same goes for moisture overload. Once your hair is re-balanced, then you can re-introduce moisture or protein according to what your hair needs and responds well to. The way I can tell I’ve got my balance right, is I get consistent results. 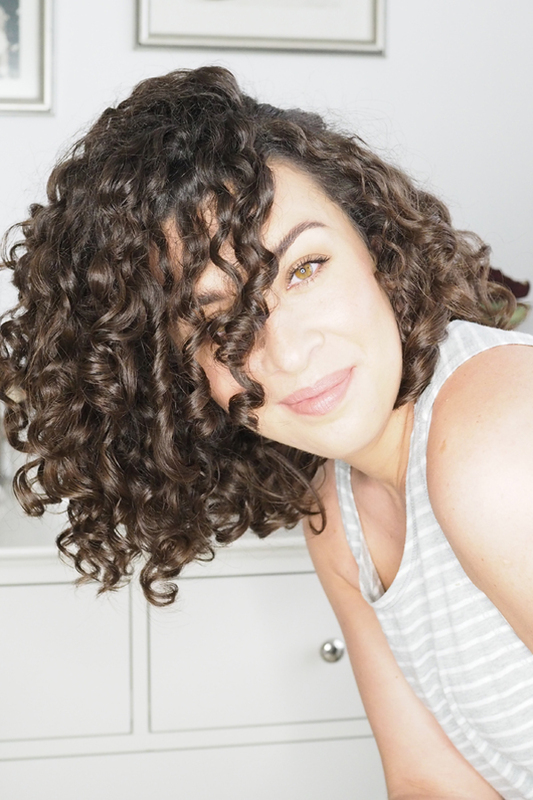 My curls form, hold and behave in a consistent way. Balanced, nothing extreme. I feel like this was post was more of a thesis! It’s taken me over 8 hours to put together! That’s how much work, time, effort, research, trial, error and editing I put into creating content for this blog. Thank you to everyone who truly understands, recognises and appreciates that. If you’re like me, I want to learn all there is to know about something before I dive in and experiment with my hair. I want to be fully informed, so I can be confident in what I’m doing, and hopefully ensure I get good results. So I don’t want to give you bits of information with huge holes in it. That’s not going to help anyone. If anything, it often makes things worse! So I try to give you all the information in a concise way that’s easy to understand. Then there’s no guessing; my tips, opinions, recommendations and advice are complete. hmm…from what you’ve said it sounds like your symptoms are more like moisture overload than protein….. Thanks for the helpful info! Have to disagree with your opinion on the homemade protein/moisturizing masks. Using a blender, of egg, avocado, olive oil and yogurt does absolutely phenomenal things to my hair. It may not work for your hair type but it gives me so much volume, thick curls etc. That’s great that it works for you, I don’t know anyone else who has results like that from those ingredients, other than shine.